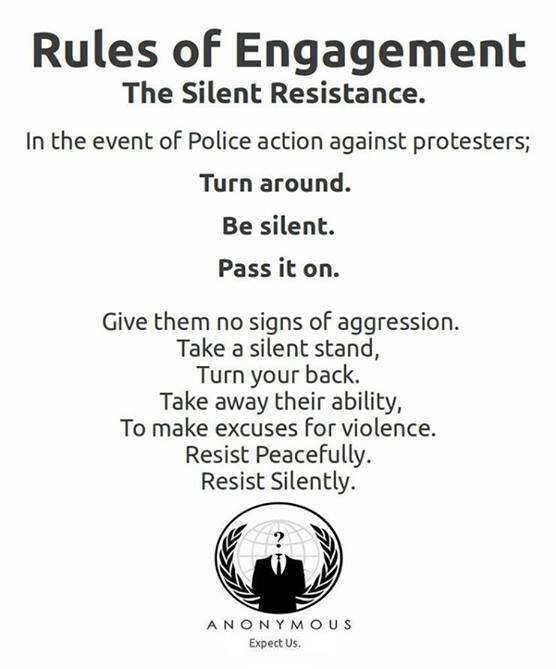 Dangerous, victim-blaming advice given to “peacefully resist” police brutality. I hardly know where to start with how wrong this image is. First off, those who are the victims of police brutality are *not* to blame for it. The police do not just attack protesters because we “give them the excuse”. Secondly, the first time I tried to “resist peacefully” police attacking a demonstration I sat in front of a line of riot police and ended up dragged across a road by them and smashed in the face with a riot shield. The UK police have a horrific record for violence – Ian Tomlinson, for example, was killed as he faced away from police (see below). Turning your back to those with a high-likelihood of attacking you is naive, but advocating it as the morally and tactically superior action is disgraceful. Thirdly, it doesn’t matter whether or not the police have an “excuse”, because as the list below shows, the state continues pretty much as usual. Things don’t change just because the population knows that a situation is unjust, but because they force a change. And turning your backs on those with weapons, a history of using them against those that want change, is not a good way of achieving that. Here’s a list from a variety of sources that I looked up off the top of my head whilst writing this post. Please add links to other instances as a comment below. Ian Tomlinson, killed by police whilst walking home from work during G20 protests. Alfie Meadows, who suffered a head injury requiring surgery when he was assaulted by police. Jodie McIntyre, dragged from his wheelchair by police and hit with their batons. Mark Duggan, shot by police. The hundreds who have died in UK police custody, with not a single officer convicted (1998-2010).